The Song of the Morning dam was opened permanently in 2014. The dam structure will come out this year, widening the river channel at the dam site. Photo by Howard Meyerson. VANDERBILT — Anglers who like free­-flowing streams got a chance to celebrate in September 2014 when the Song of the Morning Yoga Retreat dam was permanently opened on the Pigeon River allowing it to return to a free­-flowing state. It signaled a new era for those popular trout waters. This year, there is a more to cheer about as phase II of the dam removal project moves forward this month. Deconstruction will cost $365,000, money Huron Pines raised from private donations, a $293,000 state Aquatic Habitat grant and a $5,000 donation from the Mullet Lake Area Preservation Society. The Pigeon River empties into Mullett Lake. Once under water, meadows now grow surrounding the river which is cutting its way down to the historic channel. Photo by Howard Meyerson. Upstream of the dam site, where river waters were once impounded, terrestrial life is emerging. Last year’s drawdown restored about a mile of the river and its banks. You may recall that Song of the Morning dam was a source of grief for anglers and natural resource managers. Three serious mishaps, most recently in 2008, resulted in massive silt spills that damaged downstream trout populations and habitat. The river runs through the Pigeon River Country State Forest which largely is managed for its wild characteristics. Dam removal was called for in a settlement negotiated between the state and Golden Lotus Inc. which operates the yoga retreat. Golden Lotus was fined $120,000 to mitigate the effects of the 2008 silt spill that killed 450,000 trout. The dam had been a source of consternation. It impounded waters that were heated by the sun. When released downstream it was too warm for trout. Downstream trout populations are improving, according to Cwalinski. And trout now can move upstream, along with steelhead. The result of the steelhead migration and its effect on trout will be assessed, Cwalinski said. Cooler water temperatures should also mean better trout fishing much further downstream. “The bottom line now is that there is no impact from (higher) water temperatures any more at the site,” Cwalinski explained. Golden Lotus Inc. is developing a restoration plan, according to Ramsdell. 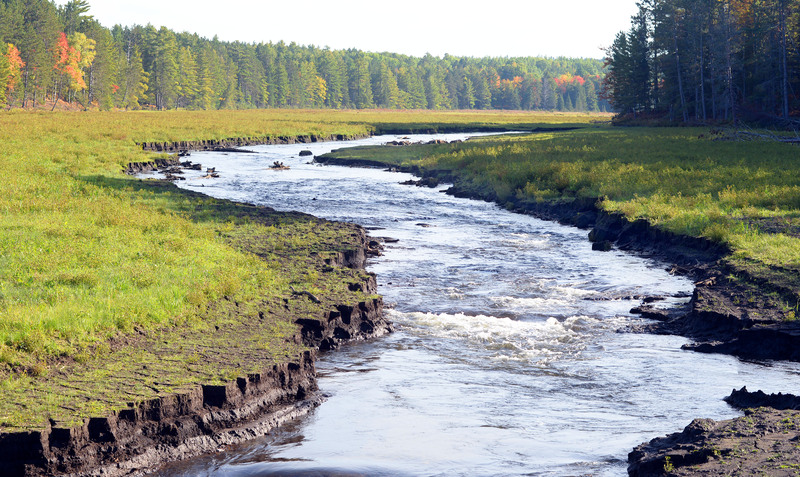 Huron Pines, for now, has opted not do vegetative restoration work on the exposed banks. “We have the opportunity to let Mother Nature do its work,” Ramsdell said. “We’ll let things take their course and determine what is needed upstream. We’re working with Golden Lotus to put together a management plan for the corridor. A lot will focus on controlling invasive species. The Pigeon River has long been a popular destination for anglers and paddlers. It was designated as a state Wild­Scenic River in 1982. All 42 of its miles will now be unobstructed by manmade barriers. And that is something to celebrate. Appears in MLive Media Group newspapers and MLive Outdoors. 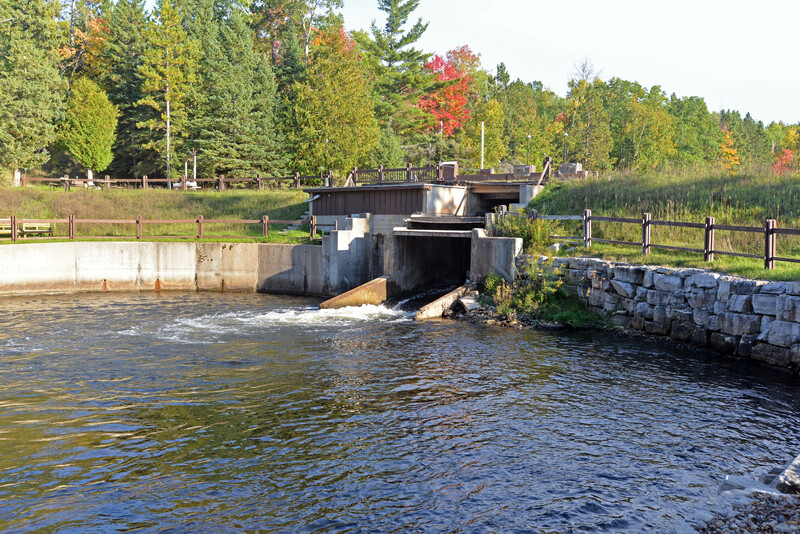 This entry was posted in Uncategorized and tagged Conservation, Dams, Environment, Fishing, Michigan Department of Natural Resources, Nature, Pigeon River, Rivers, Steelhead, Trout. Bookmark the permalink. I’d love to see what this looks like when they remove the dam. Where is this? Hi Margery. It’s north of Gaylord in the Pigeon River State Forest, northeast of Vanderbilt, the exit off I-75. It’s pretty country and getting prettier.